I don’t subscribe to the generalisation that every single moment needs to be amazing or that you have to love and celebrate every moment with your kids. That’s not what the Love the Moment Challenges (I developed as monthly challenges in 2010) are about. Rather it’s about connection and weaving significance into the moments you have. In our modern lifestyle, it’s tempting to put family life into a box for the weekend or Friday night. I’m a huge fan of planning family time — for sure — but it’s easy to weave moments of connection into the everyday, and as I look back, it’s the little things that forms deep relationships over time. Not always measurable, the accumulation of small moments create an undercurrent that acts like family glue. I originally wrote this list for myself as I came out of a cloud of depression. 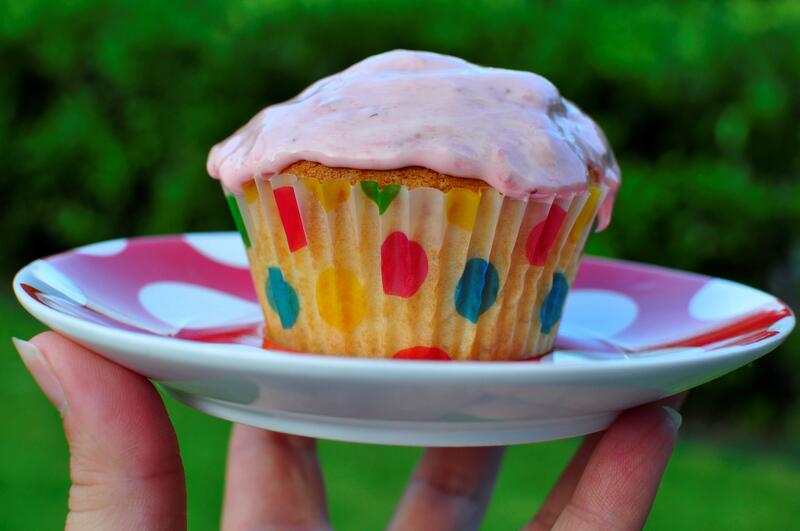 The little things: they became my new normal, and even an effortless part of my life! 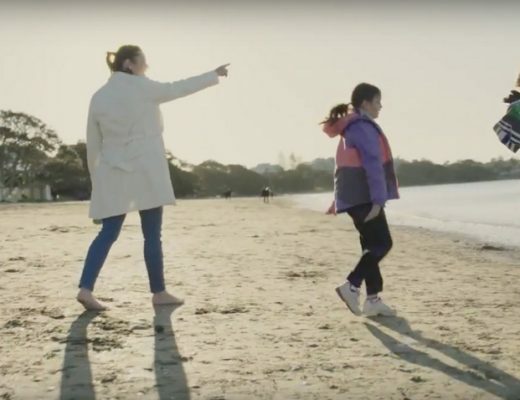 Still, there are times, mostly when I feel disconnected from my kids for a myriad of reasons (changes, dynamics, rough periods, extra busyness), that I remind myself that it doesn’t take any extra time to foster many of these moments. So I come back to this list, and pick one or two, or 20 to do each day. 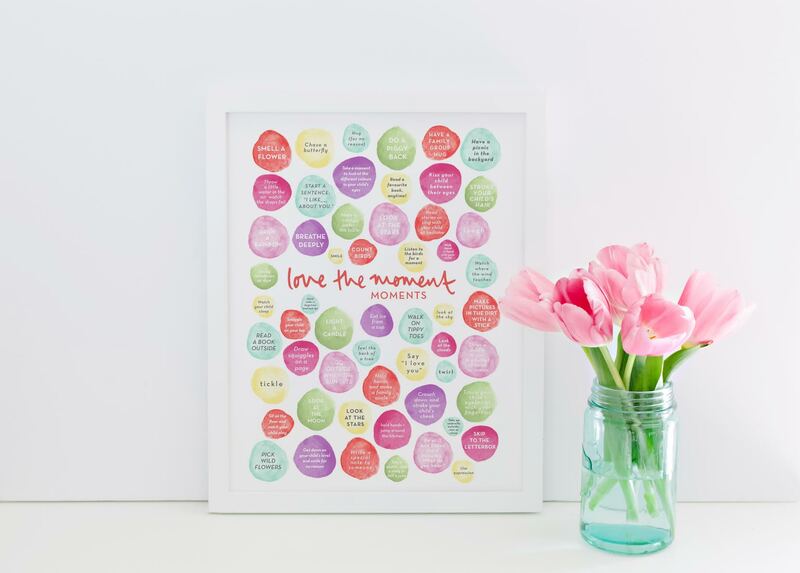 When I launched BAFM 3.0, I asked my designer (from Emma Kate Creative) to throw my list (you can find the text list here) into a printable I could hang on the wall. It looks gorgeous, and happy, and bright, and it’s easy to close your eyes, point, and do just one small thing. There’s a smaller A4 portrait version (with over 50 small ideas) and a larger A3 landscape print (with 100 small ideas). Feel free to print one yourself, gift to a friend or share with anyone who would be interested. Stick it on the fridge or frame it for the wall. You can access a non-watermark printable PDF version by clicking on the poster image. Click the picture below or here for the PDF file. 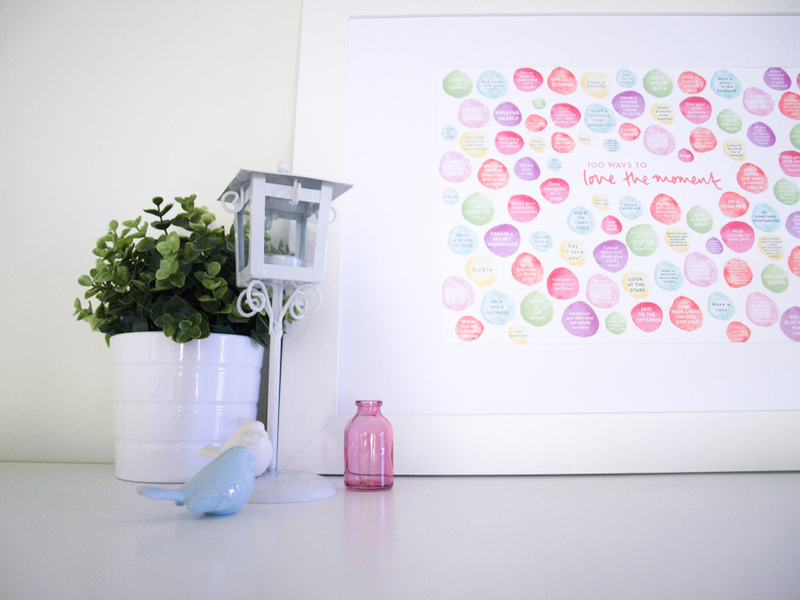 This print requires an A3 Printer, available at places like Officeworks. Love this! 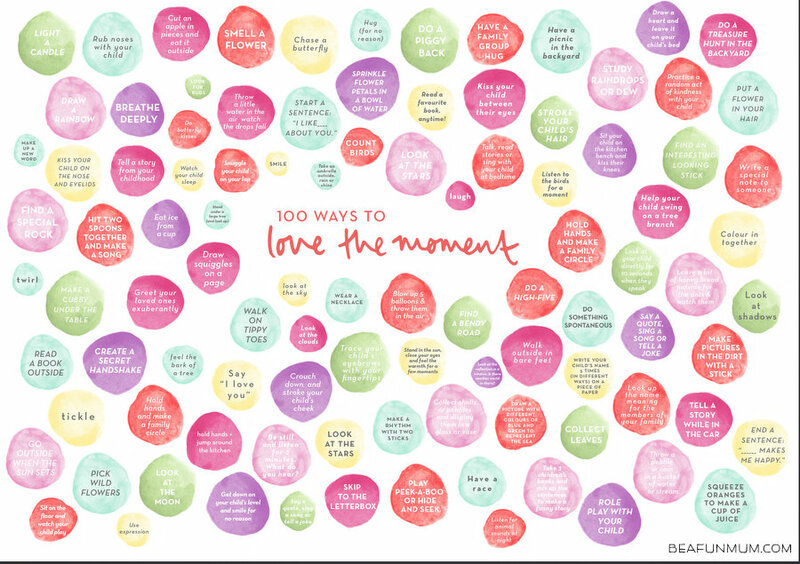 And love the idea of Love the Moment… I’ll be printing this off and looking at it often! So beautiful! Thank you for creating it in both sizes (just printed the smaller size so we have it on hand until I can get to the office store and have the larger one printed). It’s so important for us to all slow down and enjoy life like our kids do — in the moment. My oldest is leaving for college in the Fall so those little moments I can steal with him are so very much on my mind. Hey Kelly!! What a great post. 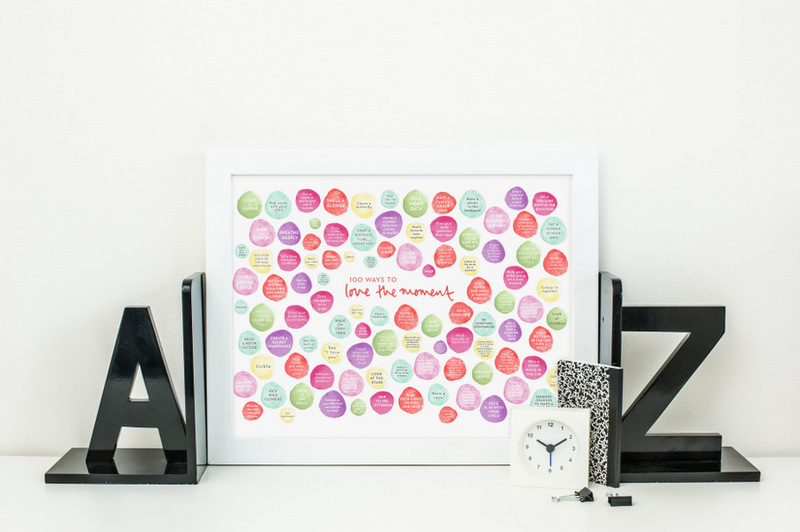 I love the “Love the Moments” poster. Thank you for sharing it! 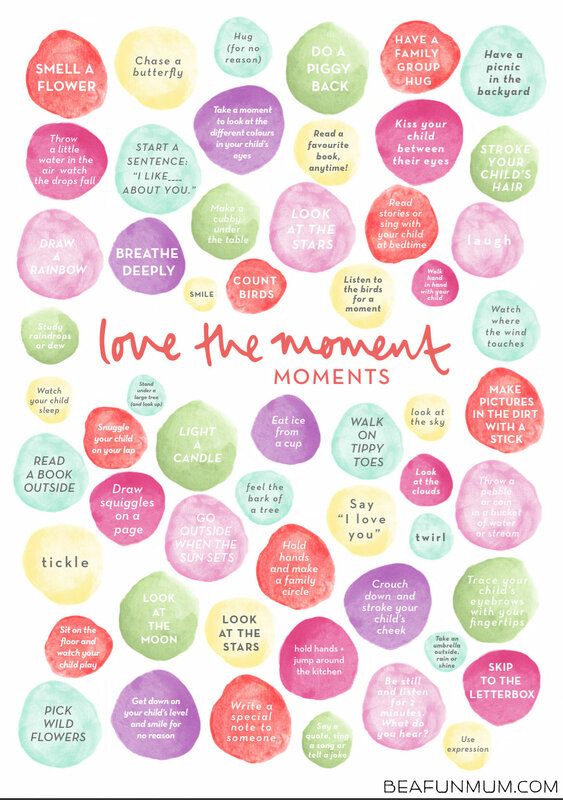 I love this and have printed it off already – a good reminder for when the days get too busy and we are always rushing! Thank you for the printable, very kind of you. 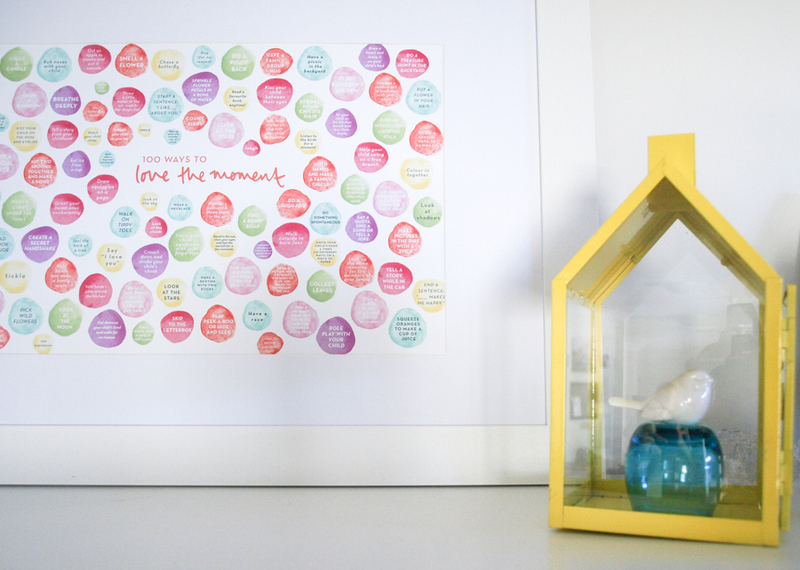 Thanks for the adorable printable!! I got them both (a4 & a3) printed at officeworks during the week. I’ve framed the a3 poster and hung it on the wall in the family room. It looks great!!! Think I might give the a4 one as a gift it a friend. 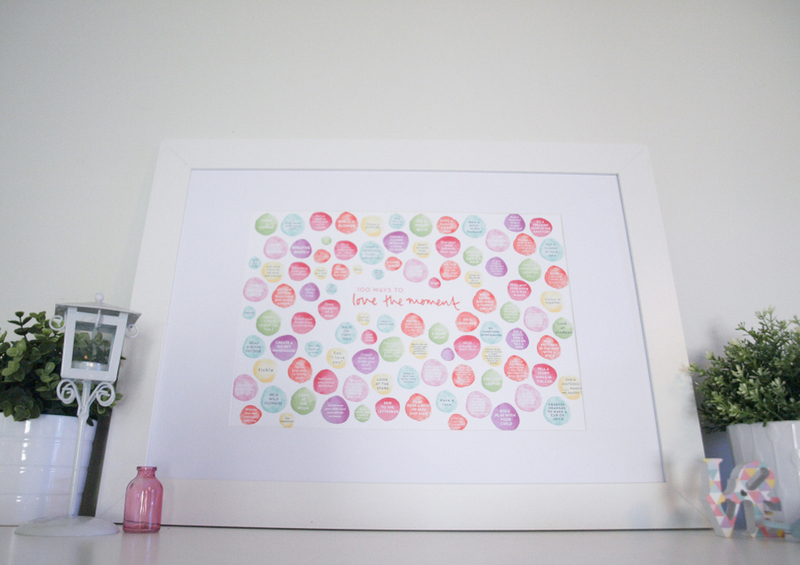 Thank you so much for sharing this as a free printable! It’s printing now to go on my fridge until I can get a copy framed.